But you know that the bigger problem for investors with this strategy, more than the volume of investment, would be to be able to maintain invested 2 years and to stand an average drawdown of 25%. how did you see that? API ? edit: now I am jealous.... I cannot use API :((( make a thread with any interesting findings maybe? or .. manage my portfolio? The 15% come from the study already done by @JJENSLOPFAM on the other discussion about darwinia. The rest is just a normal filter with 2 criterias. I am not able to use the API. I think also @JJENSLOPFAM hasnt' used it, just some smart copypaste and Excel. I have not found your post - still searching. How do you know the trader's equity 2 years ago? I thought that this info was available maybe in the API thats why I asked. It is nothing advanced, only to ilustrate the debate. Simply using the filter available in platform, using current equity to get every frame and d-experience filters. How do you know the trader's equity 2 years ago? Are you interested in the trust of the trader in his strategy today or two years ago? So let me clarify please.. @JJENSLOPFAM you saw the return of all darwins with current equity>1 and current experience=10 but how many darwins with those characteristics failed the last 2 years (=closed or deleted or both)? I imagine you dont think thats important to know ? What am I missing guys? Ok everything matters, but we are here to find the winners of today not the losers of yesterday. It is evident that there are more losers below 2000 and I can guarantee you that the number of closed darwins below 2000 is at least 10 times higher than above, I have a good memory. We are here to find that 1% of winners and that 1% is much more likely to be above 2000. If I may suggest we should maybe try to add the current VAR of the underlying strategy. I mean 10K equity with 0.01 VAR aint the same with the 10VAR like you had said.. I agree. As you say It is important to know it if we want to use this exercise to invest and take decisions with this criteria. Today we can only check the alive darwins. Ok we don't know everyting about the past but we are usung a condition of today to make a decision today. A significant trackrecord with a significant equity. but the sense was, does equity matters? Yes! A lot! I would love if the platform let do it, and check if we find some correlation with the product EQUITYxVAR. Perhaps @ignacio could help with it. I would need that this product, or the "equity equivalent" was in the criteria to chose, and analyse the results of the filter. Today we only have the two individual filter. Last week I filtered also with var, to check in the future how change the equity and the var of the community with the change of darwinia. I had not shared these charts, but here you are. OK but IMO it is not necessary for the previous study on equity because every "class" is populated enough to contain a subpopulation of different VaRs . 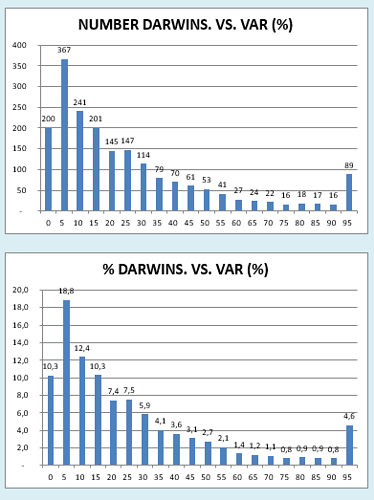 VaR would be useful for darwinia rules to be more fair but in our case also rough equity works. Only the fact of being ready to wire transfer 3-5k proves that trading isn't a game anymore for you. I would like to do the same exercise with the "equity equivalent" with similar frames in terms of risk, not multiplying different var with the same frames of equity as we could do today. Thanks a lot for your suggestion. As you may know, we are running a beta test with our DARWIN API so users can use all the Darwinex data as they wish. I will fwd your feedback to my colleagues in the IT team to see whether this is possible through the API, as granting access this way is much faster. I am fairly new here but am coming to the conclusion there is a large 'herd mentality' among Investors. I am certainly a part of that as I have a 12 Darwin portfolio all from the Top 20 AUM. Unfortunately I started just as most of them went into an extended DD period. I must admit that I am quite disappointed and surprised at how correlated my portfolio has been in this DD. Unfortunatelly it is not a problem of the Top 20 AUM . My live portfolio has 26 darwins and only 7 are in top20. Everything is going down since July. There is an army of darwins that is bleeding since 6 months.